Tonight’s episode of Designated Survivor kicks off with Hannah driving a van like a mad woman. She spots a lake near the Capitol building and drives off the road, she hops out of the van at the last minute – the van careens in to the water as the bomb is going off, luckily no one was hurt. The FBI arrives seconds later and arrests Hannah Wells, she insists that she’s being framed. While she is sitting in cuffs Forstell arrives, he orders the FBI agents to release her immediately on behalf of the President. Forstell and Hannah head to the White House and meet with President Tom Kirkman. Hannah explains that someone planted evidence in her apartment and made it seem like she was the bomber. They’re certain that Patrick Lloyd is responsible, they agree to bring him in. Forstell warns them that they don’t have enough evidence yet, and will probably have to release him tomorrow. While the FBI is coordinating the raids, Tom sits down in his office to watch TV. Aaron and senator Bowman are in a heated debate on live television over whether or not there’s an FBI cover-up at the White House and if Tom is hiding it from the people. Aaron defends Tom, and insists that he’s the most honest President they have ever had. Lloyd is at his house. He receives a cryptic message from his White House snitch stating that “Lozano has the package.” Whatever they are planning, Lloyd tells them to execute. The FBI arrives with Hannah a few minutes later, but Lloyd is gone. The FBI is shocked to discover a sophisticated underground tunnel leading out of his house. Lloyd makes it impossible to track him, suddenly Hannah begins receiving notifications from all over the country of his credit cards being used and sightings of his cars. Back at the White House, Seth has more bad news for Tom Kirkman. He tells Tom that Abe Leonard is running another story, he has sources indicating that Jason Atwood was arrested for killing Nassar and it was covered up. Tom shocks Seth and tells him to set up a meeting with Abe, he wants to speak to him face to face. Meanwhile, the snitch, Jay Whitaker, is executing whatever plan that Lloyd ordered. He slips in to a room and plugs his laptop in to the mainframe. Mike gets word that the hacker just created an ID in the Pentagon for someone, but they have no idea who. It looks like Whitaker just got Lazano access to the Pentagon building. Tom Kirkman sits down with Aaron in his office. Tom reveals to him that there’s a traitor in the White House, and he was responsible for the Capitol bombing, and it wasn’t Langdon. Tom wants Aaron to go back over his records and see if he can figure out who the traitor is. Lozano slips in to the Pentagon building with a briefcase, thanks to his new ID. He sits down at a computer and begins pounding away on the keyboard. Abe Leonard arrives for his meeting with the President. Abe scoffs that Tom is wasting his time and he’s not “staying silent.” Tom tries to reason with Abe and asks him to hold his story, it’s incomplete. He shares a photo with him of FDR, it was taken right before he passed away. But, the press never printed it because they wanted America to stay strong and not panic over the state of the Presidency. Abe Leonard arrives for his meeting with the President. Abe scoffs that Tom is wasting his time and he’s not “staying silent.” Tom tries to reason with Abe and asks him to hold his story, it’s incomplete. He shares a photo with him of FDR, it was taken right before he passed away. But, the press never printed it because they wanted America to stay strong and not panic over the state of the Presidency. Aaron pays Cochran a visit, he’s sporting a fancy new ankle monitor and can’t leave the house. Aaron explains that there’s a traitor in the White House, and he needs his help. Hannah gets a member of Pentagon security on the phone, they can’t find Lozano in the building because their security cameras are down. Hannah warns them that this is a matter of life and death – they need to find Lozano now! Abe shows up at Seth’s office. Seth is shocked when Abe reveals that he’s going to honor the President’s request and hold he story for a little while, but not indefinitely. It looks like Tom’s speech moved him. Hannah returns to headquarters, badly bruised, and deflated because there’s still no news yet on what Lozano was doing at the Pentagon. She sits down at her computer and is shocked to see an email from Jason, he sent it before he was killed. She opens the email, and its full of photos of Whitaker and a recording proving that he was the snitch working with Lloyd. 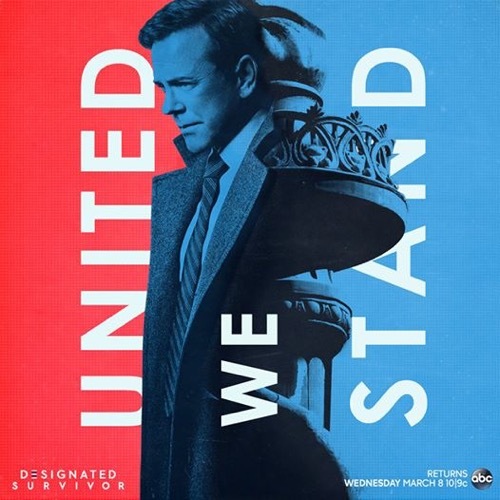 Tonight’s episode of Designated Survivor kicks off with Tom briefing Seth and Emily on Whitaker – they raided all of Lloyd’s cells, and Tom seems to think that this mess is behind them. Although they still haven’t found Lloyd himself. He tells Seth to set up a meeting with Congress, he’s ready to tell the people what is going on. After the meeting, Tom corners Aaron and basically orders him to come back to the White House. Before he meets with Congress, Tom has to choose a designated survivor, naturally he chooses Cornelius Moss. Tom takes the podium and delivers his speech, which he wrote himself, explaining the bombing and Lloyd’s group of followers, and their mission to make America great again. When he’s finished, he receives a standing ovation and is greeted by his kids. Tom takes the podium and delivers his speech, which he wrote himself, explaining the bombing and Lloyd’s group of followers, and their mission to make America great again. When he’s finished, he receives a standing ovation and is greeted by his kids. Mike interrupts the celebration and tells Tom he needs to speak to him ASAP. Hannah briefs him with her team and explains that they figured out what Lozano was doing – he sent all of the country’s most classified information to Lloyd.